People do more traveling today than at any other time in history and many parents bring a baby on board wherever they go. Traveling with a baby can be tricky, though, so Dr. Pia Fenimore recently offered online her favorite 7 tips for traveling with a baby. Fenimore, a pediatrician at Lancaster (Pennsylvania) Pediatric Associates, responds to “ask the expert” questions presented to the local newspaper. One recent question came from a mother nervous about flying / traveling cross country with a baby to meet grandparents who have trouble traveling themselves. Don’t travel until the baby’s vaccinated. Crowded airplanes and family gatherings “are great places to get sick.” Flu season runs from October through May so a flu vaccination is as important as the standard line of childhood vaccinations if travel is scheduled during the seven months when influenza travels, too. Respect the needs of a breastfeeding mother. If you are breastfeeding, let the people at your destination know you’ll need privacy, healthy foods, restful sleep, and a minimum of stress throughout the visit. Babies don’t care what time it is. Don’t avoid travel due to fears of interrupting a baby’s routine. Fenimore says babies change their sleep and eating patterns all the time during the first year. They have no routine so don’t let an unusual schedule keep you home. Most babies are not fussy travelers. Many travel peacefully but it will pay off to keep baby’s comforts in mind just in case. Fenimore suggests purchasing a separate seat for the baby so everyone will have a little wiggle room. Carry the baby’s infant car seat on the plane so it can be used as a handy and familiar bed for baby during nap time. Prepare for take-off and landing. Air pressure changes with altitude, causing ears to “pop” during take-off and landing. Arrange for the baby to be breastfeeding or using a pacifier during these in-flight moments to minimize ear discomfort. Give older children and adults chewing gum to prevent air pressure from building up in the ear canal. Babies get bored and restless, too. During a long flight, take the baby for a walk along the plane’s aisles. Read or sing to it while sitting or walking. Take a few favorite toys for baby’s in-flight entertainment. Don’t sedate the baby. 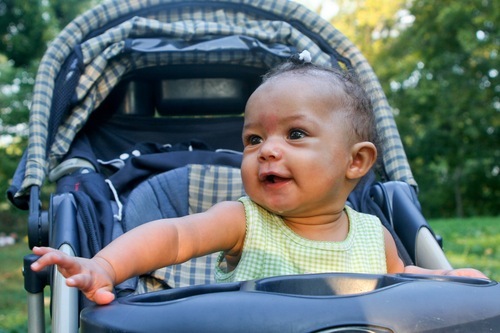 Try drug-free ways to keep a baby in good spirits while traveling. Don’t use sedatives or Benadryl, even in baby-size doses. Whether the travel is for business or pleasure, these tips are sure to make traveling with a baby more pleasant for all travelers, large or small. Fenimore, Pia. "Ask a Pediatrician: Traveling with baby? Keep these 5 things in mind." LancasterOnline. LancasterOnline.com, Sept. 2015. Web. 23 Sept. 2015. "Traveling with Children." Transportation Security Administration. Department of Homeland Security, n.d. Web. 23 Sept. 2015.